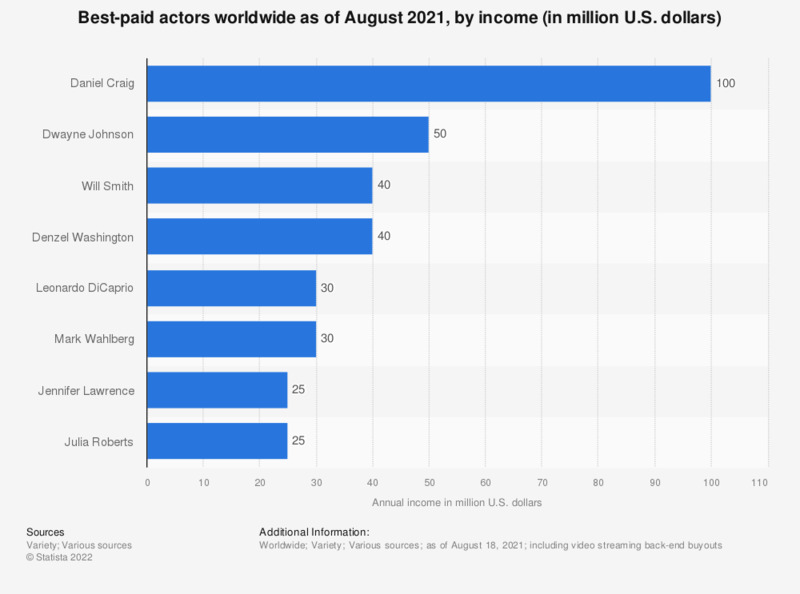 This statistic displays the earnings of the world's best-paid actors between June 2017 and June 2018. Robert Downey Jr., famous for 'Iron Man', ranked third with an income of 81 million U.S. dollars. The list also includes Bollywood actor Akshay Kumar, who had an income of 40.5 million U.S. dollars. George Clooney was the best-paid actor worldwide in 2018. Despite not having starred in a hit film for some years, the purchase of his company Casamigos Tequila by Diago secured his 239 million U.S. dollar income achieved over the last 12 months. Dwayne 'The Rock' Johnson ranked second with an income of 124 million U.S. dollars in 2018, mainly due to cuts of profits on blockbusters like 'Jumanji: Welcome to the Jungle' as well as paychecks received upfront. With regards to the film, TV, music, and sports sector, many of the top 10 highest-paid celebrities had a higher income than the best-paid actors. Kylie Jenner earned 166.5 million in 2018, over four times more than actor Chris Evans, and Ed Sheeran had an annual income more than double of that of actor Jackie Chan. Forbes methodology: "Figures are based on data from Nielsen, BoxOffice Mojo and IMDB, as well as interviews with agents, managers and lawyers."